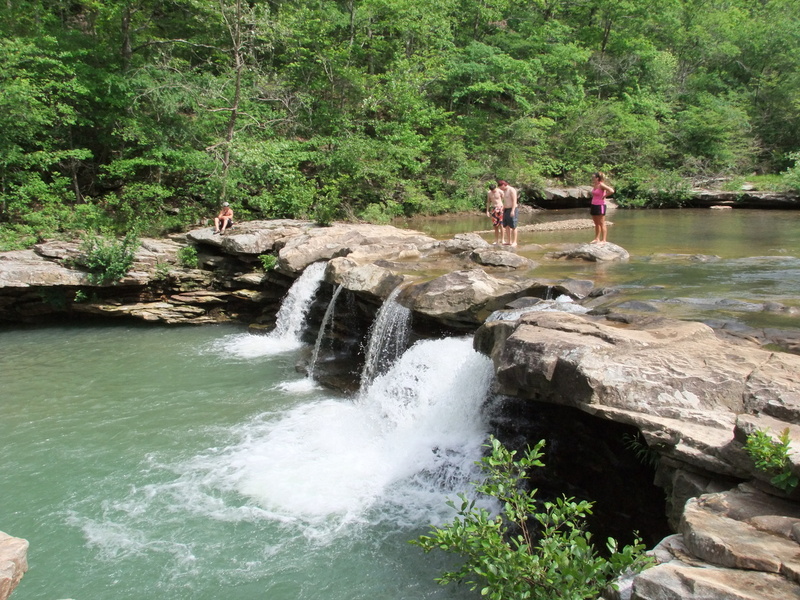 Located well off the beaten path but worth a visit is King’s River Falls. 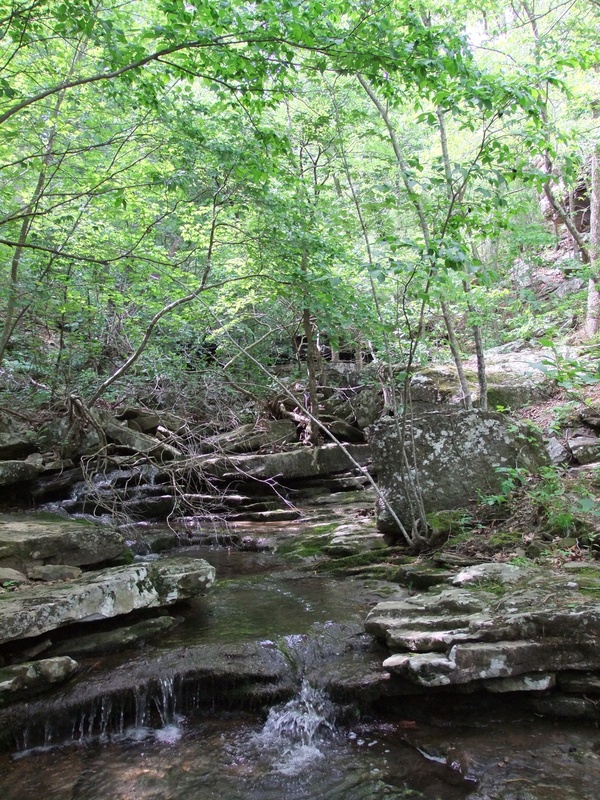 The trail is probably about 2 miles round trip. 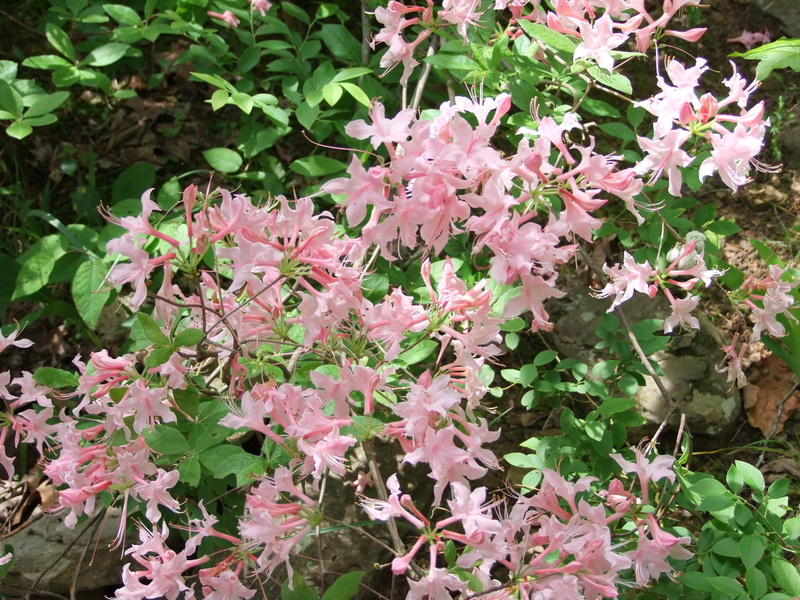 Azaleas were abundant and in full bloom along the banks. 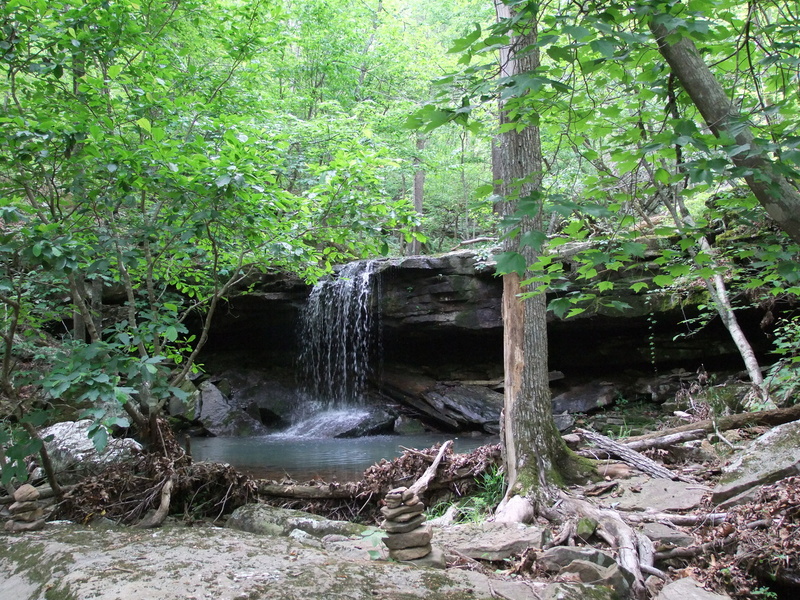 It’s not THE falls, just one of many small cascades on the river. THE falls are down there where all the people are. 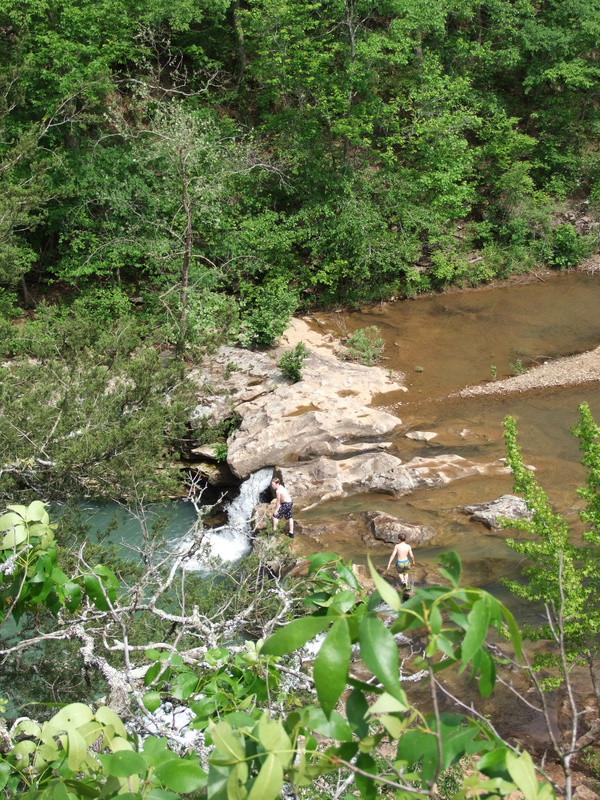 I estimated 30 people were gathered around the falls but many were beginning to leave as I approached. There was a small side stream that looked interesting so I explored that while waiting for the crowd to leave. 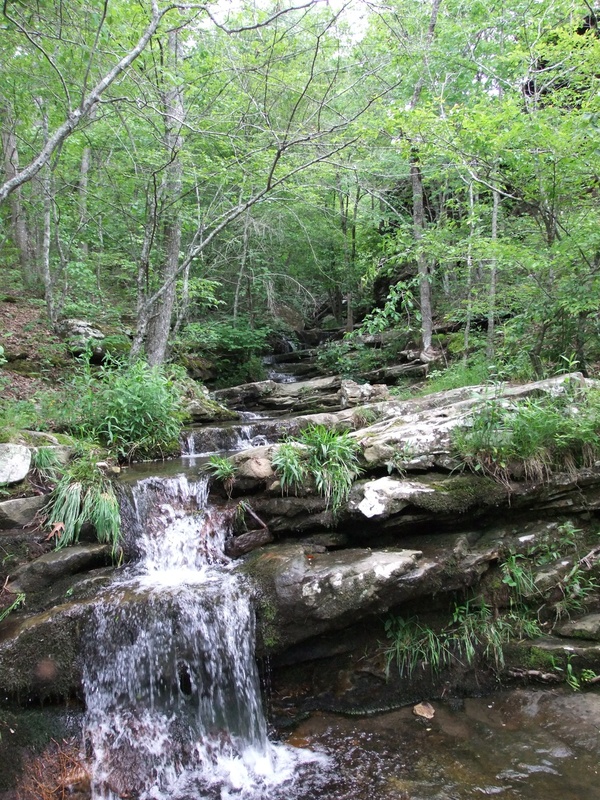 This stream was just one waterfall after another as I worked my way up – a big surprise. 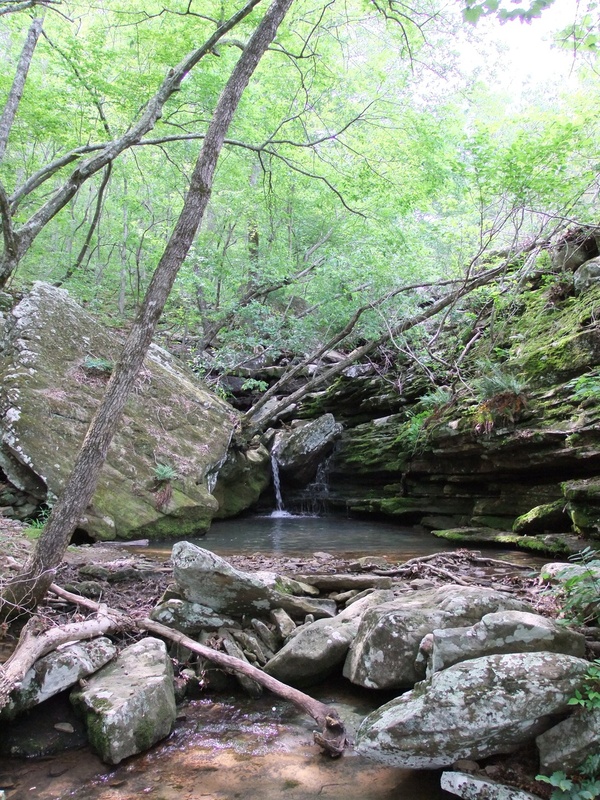 There’s no trail but lots of rocks and poison ivy to navigate. I don’t know how much further I could have gone before hitting private property but that deserves some research. 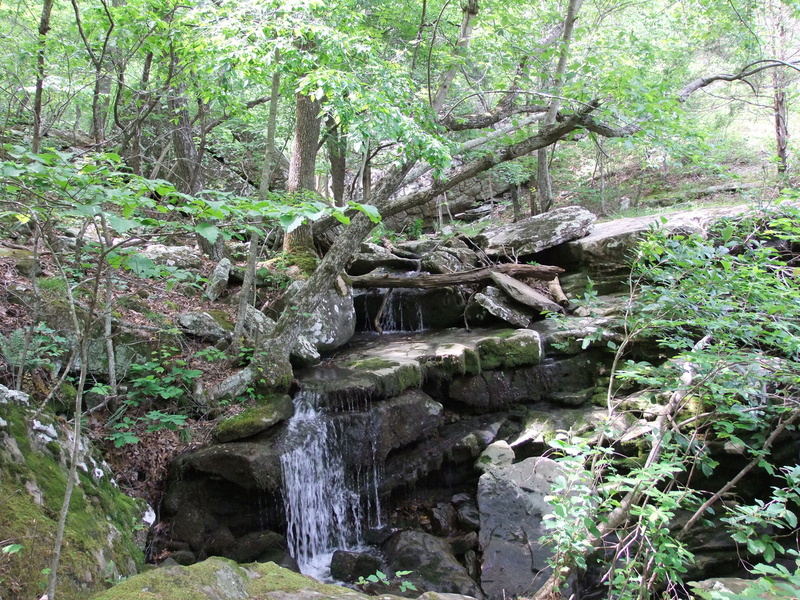 From the side stream you can also make your way out to a bluff above the falls, where I saw there was only one family left. Time to head down and get some pictures! Unfortunately, just as I got back to the falls a group of 12-15 people was arriving. I managed to get a couple shots before they started swarming. 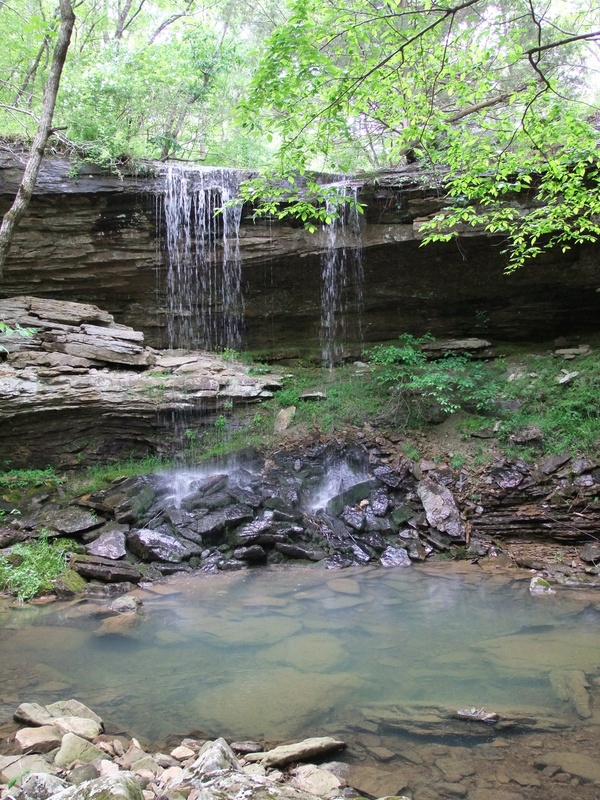 This is the waterfall on the cover of Tim Ernst’s trail book but he certainly got a better shot. 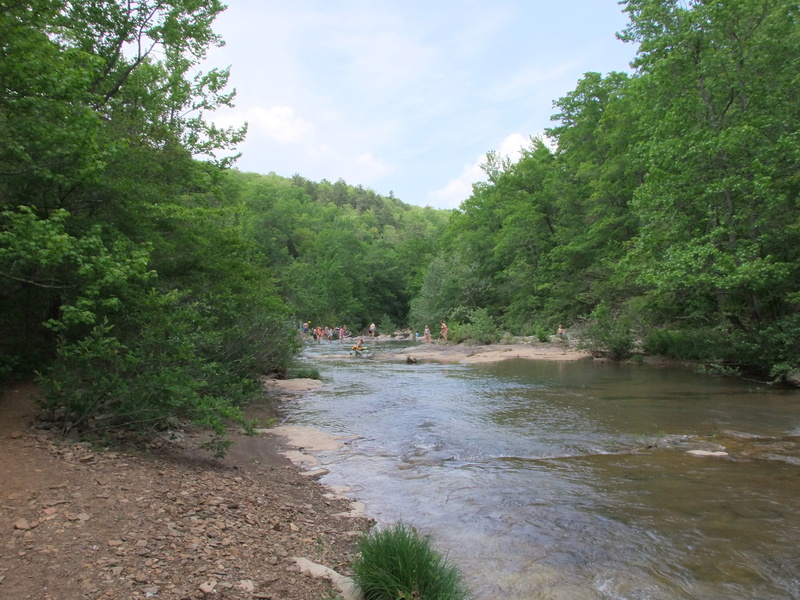 I’ll make it back there someday when there’s more water and fewer people! This was pretty much the end of my Memorial Day road trip. 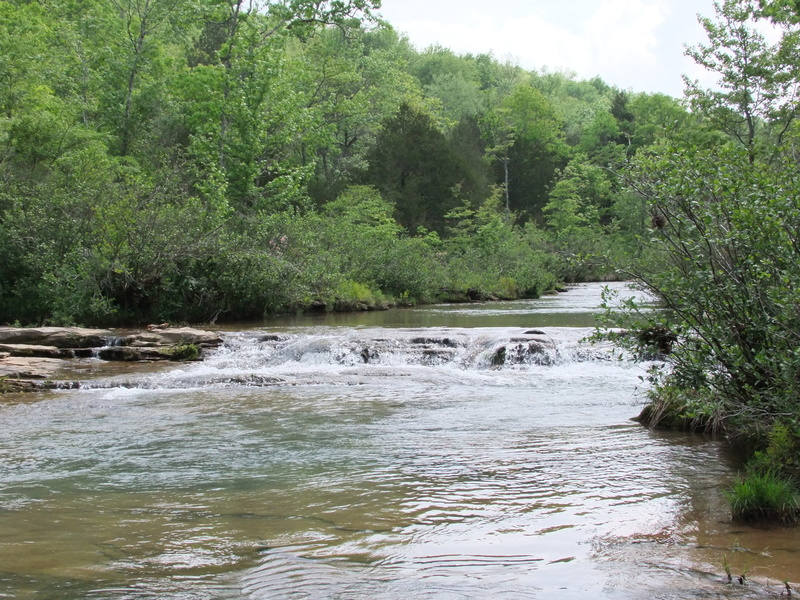 I spent the night in Springdale and in the morning drove west toward Siloam Springs and then north on AR 59 & MO 59 to see a bit of the less-traveled country. 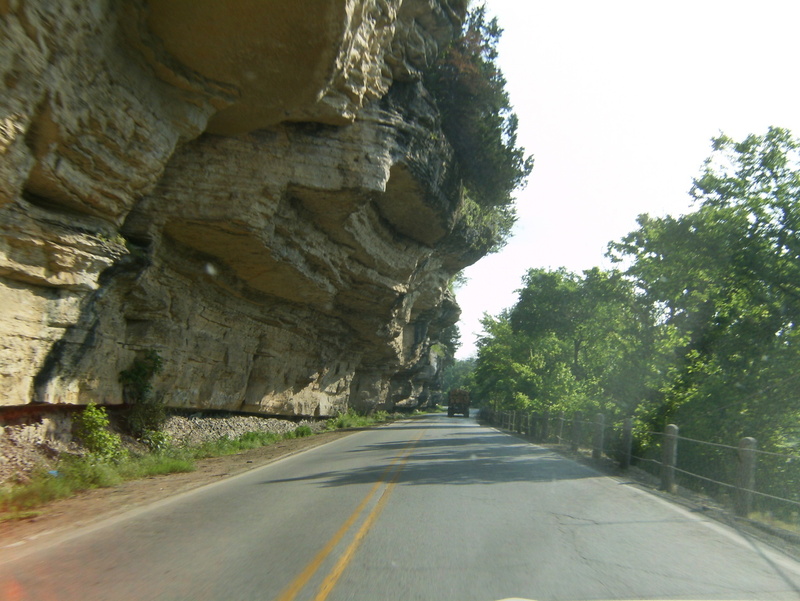 Along MO-59 near Noel you see overhanging bluffs like this. Watch for falling rock, indeed! 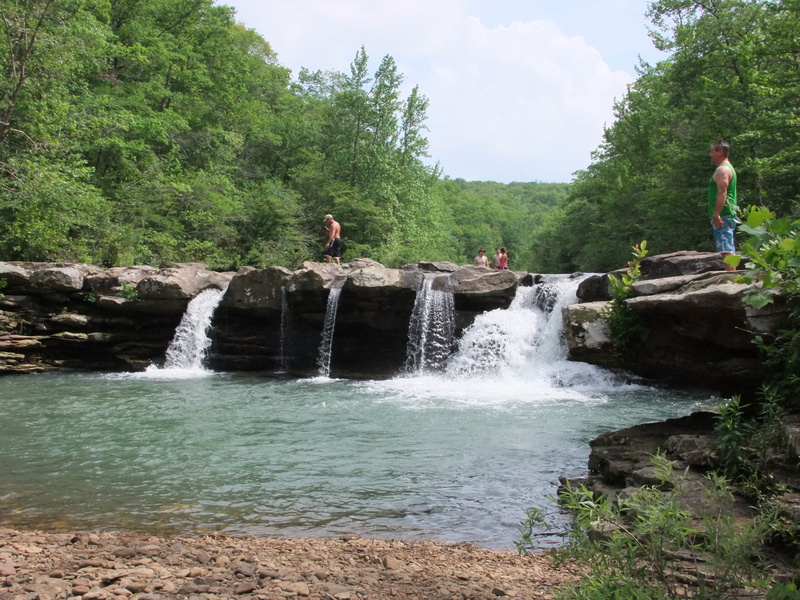 This entry was posted in Uncategorized and tagged Arkansas Ozarks, Hiking. Bookmark the permalink.